Whether you know it as a “wardrobe”, an “armoire”, or a “wardrobe armoire”, this classic piece of furniture has been around for many hundreds of years. The wardrobe armoire has long been a popular storage solution for a number of reasons. But what should you know before buying a wardrobe armoire for your home? Let’s look at five things that will help you make an informed decision when purchasing a new wardrobe armoire. If your closet space is lacking and solutions like a closet organizer still aren’t freeing up the storage space you need, a wardrobe armoire is ideal. Wardrobe armoires can be used for your everyday wardrobe, off-season clothing, blankets, linens, and just about anything else that needs a home. Your belongings will remain organized, hidden from view, and always easy to access. We can design a custom-fitted or free-standing wardrobe armoire that is adaptable to any area of your home, whether it’s in your bedroom, mudroom, front entryway, home office, or elsewhere. Free-standing wardrobe armoires give you the flexibility to be moved from one room to another if necessary. To prevent tipping and ensure its stability, the wardrobe armoire is secured to the wall. A one-size-fits-all approach when buying furniture isn’t always ideal, especially when it comes to wardrobe armoires. Buying assemble-it-yourself furniture from a big box retailer drastically limits your ability to choose a furniture piece that looks and functions exactly how you want. A custom wardrobe armoire from Organized Interiors can be designed to the exact width, depth, and height required for your space. We can also present you with many custom options, such as your choice of finishes, decorative hardware, and other features like glass door panes, shelving, mirrors, and more. 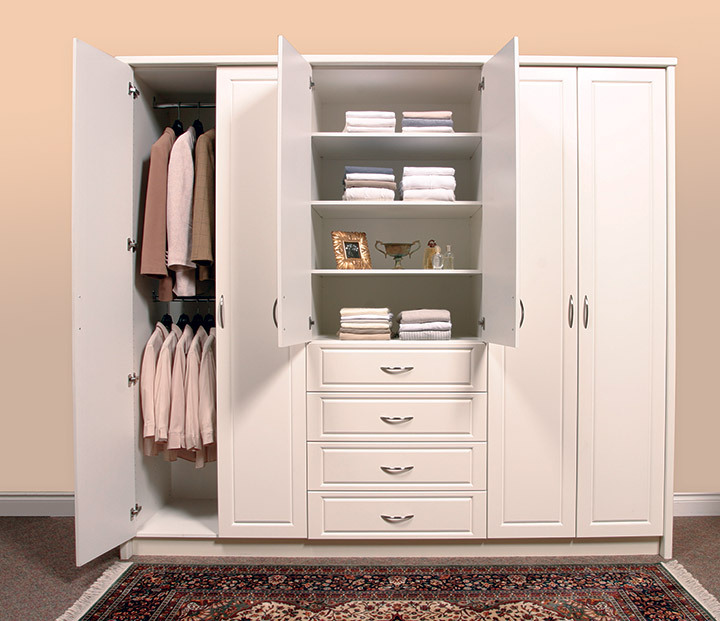 Our wardrobe armoires can also be designed according to what your storage needs are. Do you want drawers with divider inserts included to keep your smaller articles of clothing organized? Are pullouts for your shoes an absolute necessity? Do you need more vertical hanging space to accommodate storing your jackets and dresses? Our designers can make all of this possible. Wardrobe armoires are more than just an extension of your closet. 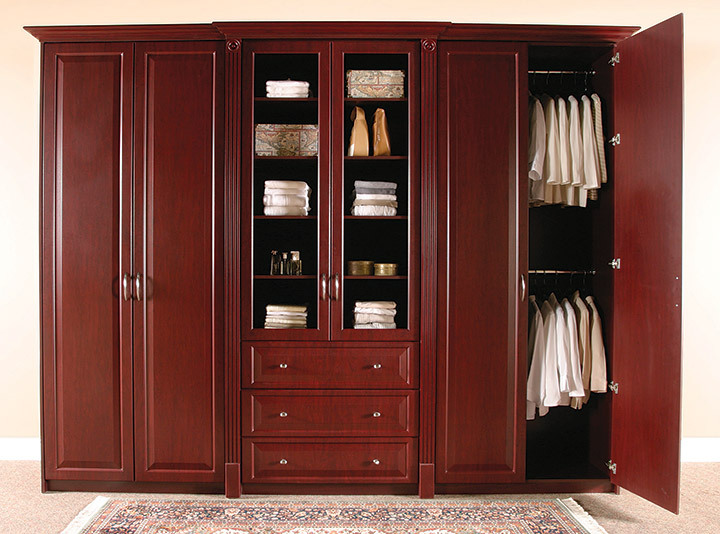 The high quality of our custom wardrobe armoires is immediately evident to the eye and to the touch. This stylish furniture piece can instantly become a focal point and centrepiece of any room it’s located in. Its design can also factor in the room’s existing décor in order to effectively complement the look of your space. Along with our wardrobe armoire storage solutions and closet organizers, you could also consider adding create-a-closet® to any room in your home in order to give you more clothes storage space. Schedule your complimentary in-home design consultation. One of our design consultants will visit your residence, measure your space, and provide recommendations for which style and design of wardrobe armoire will look best in your home. Fitting an entire wardrobe into a bedroom closet is tricky enough for one person. When it comes to closet sharing with your husband or wife, things can become downright unmanageable and acrimonious. Even if the two of you are able to fit both of your wardrobes into one closet, chances are they’re not getting stored in an orderly fashion. This makes it difficult to find exactly what you’re looking for. Consider how much time is wasted as the result of poor closet organization. There doesn’t need to be harmonic discord between spouses when it comes to closet sharing. Follow these five easy ways to remedy the issues you and your significant other might be dealing with when it comes to closet sharing. Before reworking your closet’s setup, make sure to communicate with your partner about your closet sharing ideas and your vision for its layout, going forward. Have an open mind when they share their ideas as well. Reach a consensus in terms of how the closet will be configured and the allotted amount of storage space for each of you. Strong communication throughout this closet reorganizing process fosters unity and a smooth day-to-day process in the future for both of you. The easiest way to free up closet space is to de-clutter. Empty everything out of the closet and sort through it to determine what’s worth keeping. You both need to be honest with yourselves about what qualifies as a keeper and what items won’t be missed. Be sure to donate anything that someone else might be able to get more use out of. Move off-season clothing items to another area of your home with available storage space. Once you’ve purged your non-essential belongings, give your closet a good cleaning before moving things back in. The opportunity for a thorough cleaning in an empty closet doesn’t present itself very often, so take advantage of it. 3. Establish separate closet zones. Respect each other’s boundaries. Divide the space in your closet into “his and hers” areas, with consideration given to whoever has more belongings. Respect each other’s set boundaries. By doing so, you’ll maintain an efficient organizational structure that makes finding desired items of clothing much easier. Do your best to manage clutter by carefully going through your closet at least once a year and removing unnecessary items. Even with the aforementioned storage solutions and tips, it’s possible your single bedroom closet simply isn’t big enough to comfortably hold what you both would like it to. This is when you have to turn to another bedroom storage option. Consider the benefits of a custom-fitted wardrobe closet when it comes to expanding your traditional closet storage space. A wardrobe closet from Organized Interiors offers numerous design options and is built exactly to the dimensions of the space it’ll occupy in your bedroom. Enjoy the improved closet storage flexibility you’ll have with this stylish addition to your home’s decor. It only takes a motivated effort and practical thinking to make closet sharing in the bedroom work in an efficient, mutually beneficial way for you and your partner. Book a free in-home consultation with us to get started on creating your own unique closet sharing solution. Lack of adequate storage space is a common problem that leads to time-consuming organizational chaos in the bedroom. Frantically scrambling around to find a particular item before you’re late for work isn’t a great way to start your day, is it? 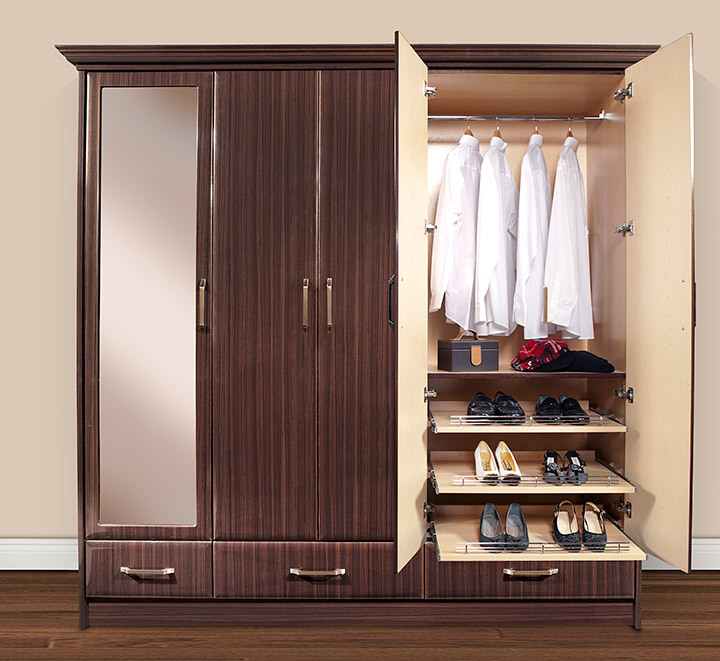 Adding a stylish wardrobe closet is one solution if an expensive renovation isn’t an option. 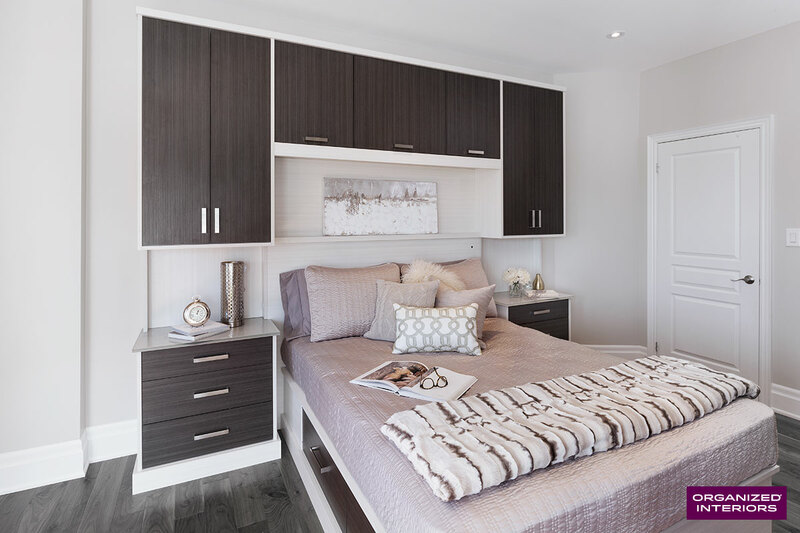 Wardrobe closets increase the amount of storage space at your disposal and can help alleviate the frustrations of functioning in a messy bedroom. How much time could this valuable addition to your storage space save you every day? You can even add mirrors to your wardrobe’s design, allowing for more room where your existing bedroom mirror is. Wardrobe closets aren’t just functional by helping to expand your closet space, they also enhance your bedroom’s visual appeal. Stylish wardrobes bring a sophisticated and contemporary sensibility to your bedroom that you’ll be proud to show off to friends and family. For your home’s spare room that doesn’t have any closet space, a wardrobe closet can be added to transform it into a guest bedroom. Wardrobes can also be used as a hallway closet if you don’t have one, or be used in just about any storage-challenged room. Cheaply made wardrobe closets from big box stores don’t deliver quality or longevity. And don’t forget about the headaches and time required to assemble them! 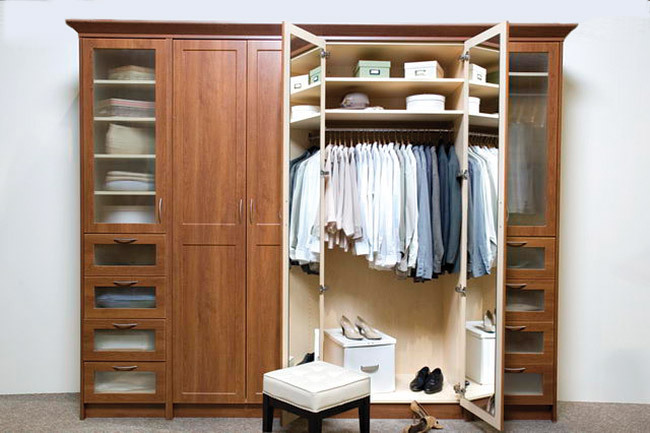 Higher quality wardrobes will serve you much longer and simply look better. Add a beautifully crafted piece of furniture to your home, not a mass-produced piece of product prone to leaning, sagging, and falling apart. Custom-fitted and free standing wardrobes from closet organization specialists allow for greater design flexibility to reflect your tastes. Choose from a wider selection of closet finishes to complement your bedroom’s existing décor. 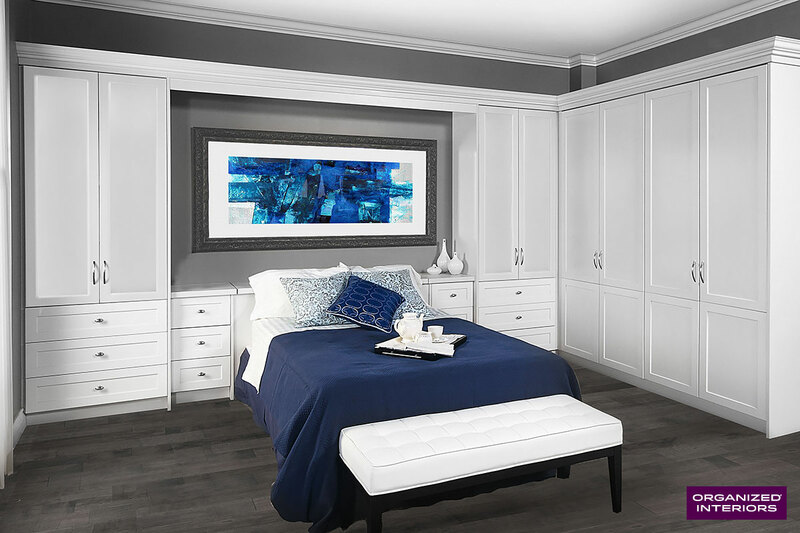 You can also customize your wardrobe closet with a variety of door and drawer styles to select from, as well as enjoying the many accessory storage options available. A practical wardrobe closet can help with your closet space woes and will quickly become an essential part of your bedroom’s makeup. For solutions to all of your wardrobe storage needs, arrange a free in-home consultation with Organized Interiors today. In many areas of life, it’s not how you start that really counts, but how you finish. The same is true of the shelving and cabinetry in your home: the finish is the first thing people see when they walk in the door. And that means the finish you choose for your storage areas makes a huge difference in the overall impression your home makes. That’s why you don’t want to skimp on the finish. Choosing an elegant, durable finish that complements the style of the rest of your home is one of the key elements of good design. The good news is that modern technology has led to significant advances in the manufacturing of finishes. It’s now possible to find high-quality, durable finishes that can blend in with any home décor. There are a couple of questions you should ask yourself when thinking about what finish is right for your shelving or cabinetry. Where will the storage area be? Obviously, what’s right for custom cabinetry in your bedroom probably won’t work in the laundry area. What style is right for your home? A lot of times, this comes down to a choice between two basic options: a modern solid finish, or the more traditional look of wood. At Organized Interiors, we offer a wide range of wood grain and solid colour finishes for you to choose from. Technology now allows us to precisely duplicate the appearance of wood without the problems of warping that come with real wooden cabinetry. A darker wood finish can give your cabinetry or shelving a classy, traditional look, while lighter options can work with more modern décor. Solid finishes create a smooth, modern look that can add a touch of contemporary elegance to your home. 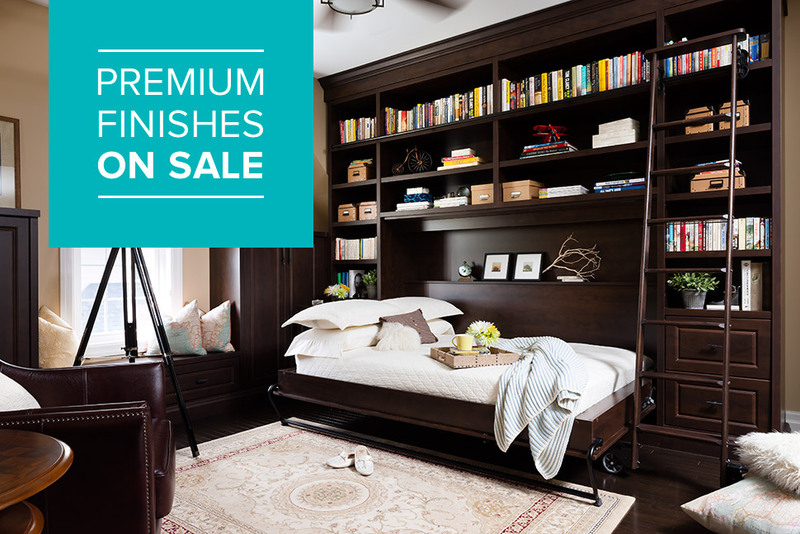 And best of all, until September 20, 2014, all 10 of these finishes are on sale. Visit our showroom to see all of the finishes or schedule a free in-home consultation and find out how you can get the perfect finish—for less.